AllBrands is an Authorized Juki Dealer and Service Center for any repairs including warranty parts, electrical and labor. We give unlimited technical support by email, fax and phone. We service machines in our stores. Mass merchants do not have tech service or repair departments for your equipment. They are unable to help you directly, only referring any operational, mechanical or electronic questions back to the manufacturer instead of taking care of the problems themselves. Manufacturers and customers should expect that any problems you have will be taken care of by the dealer or merchant who sold you the equipment, not by just referring your questions back to the manufacturer. HSN's video offer below does not offer anything like AllBrands Optional 5 or 10 Year Exclusive Extended Parts and Labor Repair Warranty (HSN only offers the manufacturer's 5 Year parts and 2 year electrical parts warranty with no labor coverage at all*), nor all optional feet accessories.. Also HSN does not have any in house technical support and service department, referring any of your questions and repair needs back to the manufacturer based in Japan with a single non-retail warehouse in Miami. Juki authorized full service dealers are not obligated to service HSN machines under warranty, so you are on your own with no warranty for labor, and no easy access to full warranty service after purchase. *"Manufacturer's 2-year electrical parts warranty: motors, light assembly, wiring, switches, circuit boards and speed control, and 5-year mechanical parts limited warranty"
Juki Pearl MO654DE has automatic self-threading lower looper, adaptor for converting to 2 thread for finer roll hems/flatlock stitching/decorative stitching, and the safety feature of machine not being able to run the machine unless all the doors are closed. So, fingers can't be in the loopers underneath. Otherwise same as Juki 644D which is without the above features. 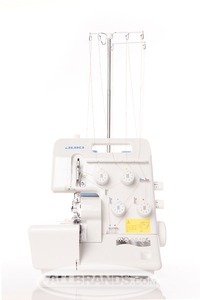 The Juki MO-654DE Overlock/Serger is essentially the same machine as the new Bernina 800DL with lay in tensions and lower looper threader and older Bernette Funlock 007D and 004D all made by Juki in the same factories as the Juki MO600 Series. We prefer the round tension knobs on the Juki brand because they are closer to the needles and loopers, and threads stay in tension longer on the round knobs. Juki is the world's largest manufacturor of industrial sewing machines and sergers. They make Juki and Bernina sergers as well as Singer's top of the line computer sewing and embroidery machines from the XL5000 down. What is the safety feature on the Juki 654DE? 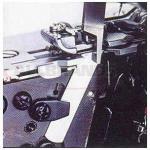 The safety feature prevents the machine from serging until the doors are closed on the machine. What types of feet are available? 2/3 thread converter, blind stitch presser foot, beading presser foot, elasticator presser foot, piping presser foot, gathering presser foot, cording presser foot, snap-on/off presser foot replacement. Where is the Juki 654 serger made? All sergers do roll hems and differential feed, so the difference is how many threads you might use. I recently purchased a Juki Lock MO-654DE serger, which by the way I absolutely love, but I have alot of chair sashes to serge for a wedding (180) and I was thinking I should order a replacement knife for it to have on hand. I don't see where I could order another one, or if I even need to. Also in the video it shows an accessory that is a plastic plate that has measurements that you could get to go with your serger, and I was wondering where I might order one. Thank you. Barbara S.
(R)Thank you for the information John, I appreciate it, look forward to purchasing other items with AllBrands, great prices, great services, easy too!! The customer service representative who helped me via email was AWESOME!! I will continue to buy my future sewing machines from your company. The serger is perfect, the help and suggestions I received were above and beyond my expectations. The machine shipped half way across the country in 2 days. You guys are my Rock Stars!! I found your website by simply using Google. My first experience with AllBrands.com has been beyond what I could have imagined. I was put in touch with Vernique (extension 124) and she went above and beyond to help me find exactly what I was looking for. She was knowledgeable and polite, and quick to assist me. My products arrived in perfect condition in time for the Christmas holiday, and I cannot be more satisfied with my experience with AllBrands.com. I will definitely check your website first the next time I need sewing products. I was very please with you price. Thank you so much and it came so quickly. I have delayed purchasing a serger until I was sure that I needed one and would use it. Prior to my purchase, I had never even operated a serger before and I was feeling a little intimidated about trying to learn on my own. I am happy to say that I am wishing that I had purchased my serger sooner! The Juki MO-654DE does everything I need and a bit more as well. The workbook that came with the serger was very well written and I was delighted to find myself threaded and serging in no time! I have to mention also that your price was $200 less than any other dealer that I could find on the internet or in the Los Angeles area. I will definitely purchase from you again. No problems whatsoever, thanks for the great service. Very speedy! Thank you for your response to my email. After seeing what great package deals AllBrands.com offered, and getting such a speedy reply from you, I decided to give you my business. Such a great deal! I actually spoke with you, John, a few years back in reference to another machine I bought. We emailed each other and your response was always quick. I never felt rushed or that my questions just didn't make sense. Over the past 15 years or so I've purchased a few gravity feed irons, steamers, and 2 sewing machines. Each purchase was seemless! Your prices have always been the best (and let me tell you I scour the internet, too). You have been and will always be my first resource. And I have no hesitation in referring you to friends or clients. I am very happy with my purchase. I enjoy all the free extra accessories that came with my serger. I still have my 20 year old Bernina Bernette 335D serger. It was time for a new serger and I am happy with my choice. I called John to ask him about a good quiet serger machine and he helped me a lot with the machine selection. Now that I've got this mew machine I can do lots of things . Thank you John for the time. I am very happy with this MO654DE Juki. It was a great buy. Thanks. Hi, again I just want to say that I am very happy with this new machine. It's pretty quiet and very good. Plus with all the feet included, this is the best buy of my life! To be honest, I was going to buy the machine on hsn.com, a Singer Quantumlock because of the flex pay. But then I said, let me ask somebody that knows about them, and I ended up buying on your website. I hope next time that I need something I will check on your website first. Thanks so much. God bless you ! I have used my new Juki Serger and love it! I had to wait for the extention table (understand) and now have it and love it! I have shopped with you in the past and will continue to do in the future. Thank you for your service. I am very satisfied with the survice from your company......I would not buy major appliance from anywhere else....thank you so much for your speedy shipment. Everyone I spoke to was very courteous and helpful. Product arrived in excellent condition and on time, even with approaching hurricanes. My serger is missing the part as indicated on the web page; I have contacted your company 9/2/2008 and received a response 9/3/2008; I realize Hurricane Ike has not helped matters. Thank you for you attention. I would shop with you again and would recommend you to friends and family. I have purchased from Allbrands before and have always been pleased. The only problem I had was the dvd with my order was blank. I did a lot of research on the Juki serger before I decided to purchase with your company. This serger is incredibly easy to use and feels of high quality. The availability and pricing of this unit is outstanding from your company and would definitely purchase from your site again. Thanks! 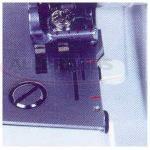 Juki lock home sergers are easy to use and are known for their high quality sewing performance.